Ask fellow campers about "Fas Gas RV Park" and nearby attractions. Park is basically a parking lot next to a gas station and small grocery store. They have full hookups, but only 30 amp electric. For an overnight stay, it was very nice. Utilities are centered on the sites and worked well. Check-in was easy, and the location of the park is near the main roads. We would definitely make this an overnight spot again. We camped at Fas Gas RV Park in a Fifth Wheel. There is a cultural and visitor center across the road. This is a basic place to park overnight with 30A, water and sewer. It is convenient in and out, relatively inexpensive for full hookups. It is immediately adjacent to the Fas Gas station, but traffic on the road and into the gas station drops off noticeably in the evening and was surprisingly quiet. The pull through site we were assigned was dead on level and it appears the rest were also. It is near the junction with the Alaskan Hwy and the spur highway going to Haines, AK. There were pay showers and presumably restrooms in a separate building but we didn't check them out. We camped at Fas Gas RV Park in a Travel Trailer. This is a small RV park located next to the gas station. We had a pull thru with 30 amp and water. Sewer wasn't available because of frozen lines, blockage, not sure. But they were working on the problem. There is a store, The Little Green Apple, next to gas station. Good selection of food including produce and fresh bread every day. We camped at Fas Gas RV Park in a Fifth Wheel. Visit the cultural center across the street. Very friendly staff. We ate at the 1016 Pub. Food was basic but well prepared. Convenient for an overnight stop. Staff helpful, congenial. Came to tell us there had been a grizzly sighting in the park! Never saw one. We camped at Fas Gas RV Park in a Travel Trailer. 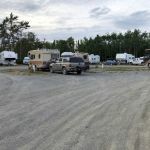 Like many RV parks in the Yukon just a parking lot with partial hook ups but a very good price and convenient off the highway-good for one night. We camped at Fas Gas RV Park in a Travel Trailer. We reserved a 50 amp pull through site with a sewer. At the time of the reservation they said we would get a 50 amp, pull through with sewer. OK, fine. Upon arrival they told us they did not have 50 amp service, only 30 amp. They also said they had no sewers. But, I thought that might be OK because a large sign at the entrance advertised they had a dump station. BUT the office said they didn't have a dump station either, in spite of the sign at the entrance. Staff was very unfriendly, not helpful and not at all sympathetic. I later learned that most of Canada has only 30 amp service. So, since that is the case we should have been told only 30 amp was available when we made the reservation. Why tell your guests they can have 50 amp when you know you can't provide it? There is no laundry either. You have to drive to a motel a few blocks away and take your chances there. This really isn't an RV park. It's a dirt lot that adjoins a gas station. Would not stay here if it wasn't the only place nearby. We camped at Fas Gas RV Park in a Fifth Wheel. There is a good bakery. Fortunately, they have no connection to the RV park. We stayed at Fas Gas overnight during our travel back to the Lower 48. This is a "no frills" spot as most campgrounds are in the Yukon, but does offer water and electric. 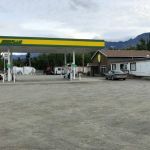 As previous reviewers mentioned, the gas station is part of the property as well as the convenience store and small grocery store. No discounts are offered and the stated price is $25.00 no matter what. Not a bad price in the Yukon for a long parking site overnight that is convenient to on and off for the highway. We camped at Fas Gas RV Park in a Fifth Wheel. This was the first rv "park" parking lot I spotted coming into Haines Junction from the East on Highway 1. There was only 2 other rv's on the lot and since I needed to refuel, restock and rest for the Sabbath, I registered for 2 nites. Checked in at the fuel station. Staff very friendly and helpful. This is a no frills parking lot. Long, open fairly level, close, gravel sites. No shade. There is a good,well stocked grocery on site with fresh meat pies. I would stay at the other nearby rv park if I were going to stay more than a couple days. We camped at Fas Gas RV Park in a Truck Camper. Hike the river trail near RCMP office, Visit historic Our Lady of The Way church and Da Ku/Kluane National Park and Reserve Visitor Center. Pine Lake, Kluane National Park and Reserve and Haines, Alaska all near. Don't miss Libby Dulac's Art Studio. This is a good little overnight park going to or from Alaska. Level, long pull thru's, fairly close, and only water and electric available. Sewer is installed, but not yet operational. Even though you are next to the highway, there is basically little traffic after 9 p.m. The convenience store at the gas station has a good selection, and the little grocery next to it has a good stock, including yummy fresh baked goods every day. We camped at Fas Gas RV Park in a Motorhome. Loved the yummy baked goods next door at the grocery. The baker is a whiz at making these delicious bakery treats. When that is closed, the convenience store has the leftovers from the day, but they sell out pretty quickly. We stayed here to and from Haines Alaska. Long, open sites, check in at the gas station. Fairly level. There is a wonderful bakery in a food trailer on site. Very nice young female baker is producing excellent pastries and meat pies. They are sold in a new, small grocery store next to the gas station. Clean, well stocked considering how far Haines Junction is from everywhere. The bakery and store were a great surprise. The RV park is gravel and plain, but the bakery and store was a highlight. Will stay here again. Stayed in a 42ft towing. We camped at Fas Gas RV Park in a Motorhome. This is a bare bones electric only park (water and dump available). It has great level sites allowing for us to not unhook. We had a quiet night of rest at the lowest cost RV park on the Alaskan Hwy. We would use again. We camped at Fas Gas RV Park in a Fifth Wheel. This is probably one of the lower cost parks you will stay in on the road to Alaska. The sites are flat. When we checked in they still had not turned on the water but that wasn't a problem. We had difficulty getting Wi-Fi. I had to sit outside to get any signal at all. Would stay here again for one night. We camped at Fas Gas RV Park in a Motorhome. This is basically an RV parking lot with fairly level gravel sites offset by small posts and a few scattered picnic tables. It got us off the road for a night of rest. The Wi-Fi worked great! We camped at Fas Gas RV Park in a Fifth Wheel. Right next to Fas Gas. Nice level gravel sites, and well spaced out. We camped at Fas Gas RV Park in a Fifth Wheel. Are you affiliated with Fas Gas RV Park ?